Tricky Software’s freshman game offering is an entertaining and well-produced title, but the basic play mechanics are bound to leave experienced gamers craving something more elaborate. The game is fully 3-D and uses an interesting over-the-shoulder, third-person perspective, but the gameplay mechanics of Armado will be instantly familiar to anyone who’s played a side-scrolling action game like Sonic the Hedgehog. Armado spends the game running and jumping—occasionally hopping over chasms or clearing spike-ridden threats. He can also roll himself into a ball for an extra (albeit limited) burst of speed or to knock into his enemies—wave after wave of giant ant that can either be dodged or knocked to its doom by a swift smack from our intrepid hero. Here comes the hotstepper In his quest to save the Queen of the Eagles, Armado must grab goodies like this gem while avoiding pitfalls such as birds throwing rocks, lava, and seemingly endless legions of giant ants. You’re limited to moving in a forward or backward direction with Armado, which makes gameplay extremely simple to use. I’m no fan of overly complex control systems for video games, so this was a welcome respite from the norm, although I recognize that the lack of challenge is likely to frustrate more experienced gamers. The overall visual quality of Armado is solidly in shareware territory. Terrain isn’t spectacularly detailed, although there are some nice accoutrements (waterfalls, for example, or details on distant vistas). Sound effects and music aren’t overwhelming and seem well-suited to the game. Although there’s certainly violence here—the ants are on a constant march to get rid of Armado by using falling boulders, plunging tree trunks and, quite often, themselves—there’s nothing gratuitous. You won’t have to worry about squishy ant guts or elaborate animated death sequences. 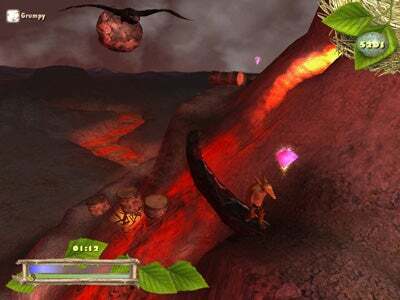 (In fact, when Armado dies in this game, his armadillo spirit form rises to the heavens.) So I feel comfortable recommending this to families with kids who are looking for a game that isn’t too violent, but has enough action to appeal to the Game Boy generation. Playing Armado, you don’t come away exhausted or spent—it’s a simple-to-learn game that’s relaxing, despite being an action game. Interesting animals and a fantasy-based storyline make it an entertaining romp for families, too.